This is a walk through of an example networking project with considerations of the argosVu drawing and state functionality. Add a new empty game object, from the menu Game Object -> Create Empty. Rename the object to “NetworkManager” from the right-click context menu or by clicking on the object’s name and typing. Find the component Network -> NetworkManager and add it to the object. This component manages the network state of the game. Find the component Network -> NetworkManagerHUD and add it to the object. 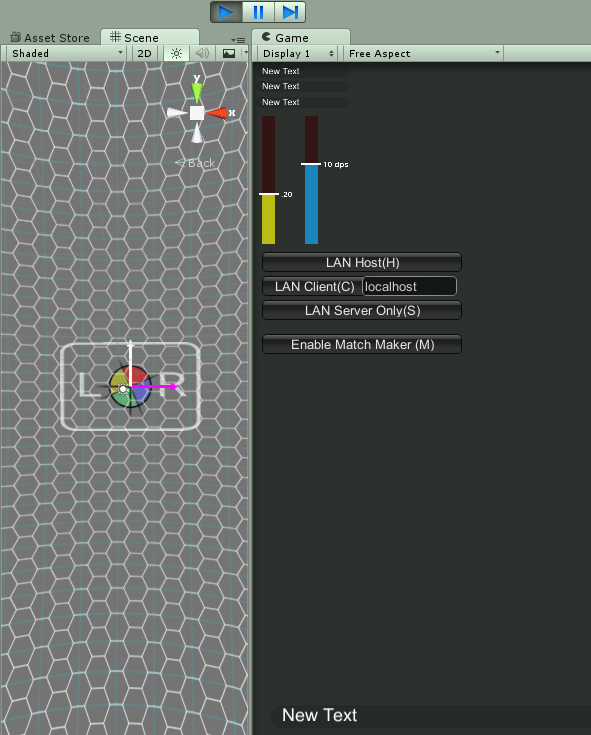 This component supplies a simple user interface in your game for controlling the network state. For more details, see Using the NetworkManager. 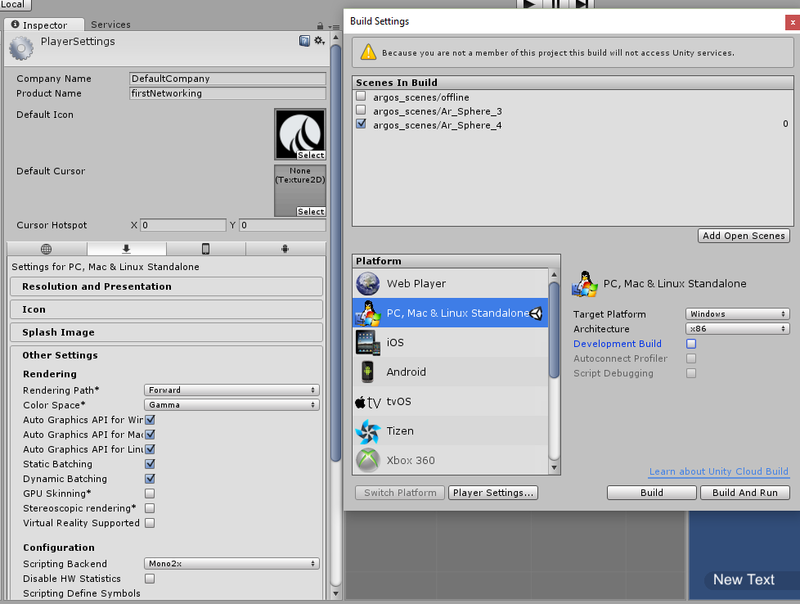 The next step is to setup the Unity Prefab that represents the player in the game. 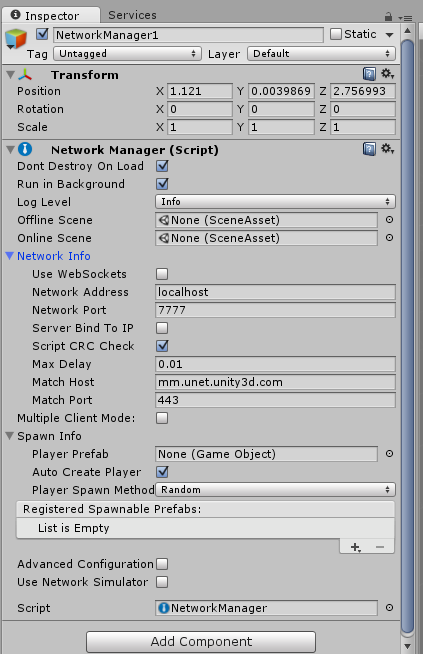 By default, the NetworkManager instantiates an object for each player by cloning the player prefab. In this example, the player object will be a simple cube. Here we need to consider the camera and its interaction with the reticle and the draw functions – The prefab needs to collect GOs like ArgosSphere and links to UI events – Player roles i.e. local/remote need to be differentiated. Add the component Network -> NetworkIdentity to the object. This component is used to identify the object between the server and clients. 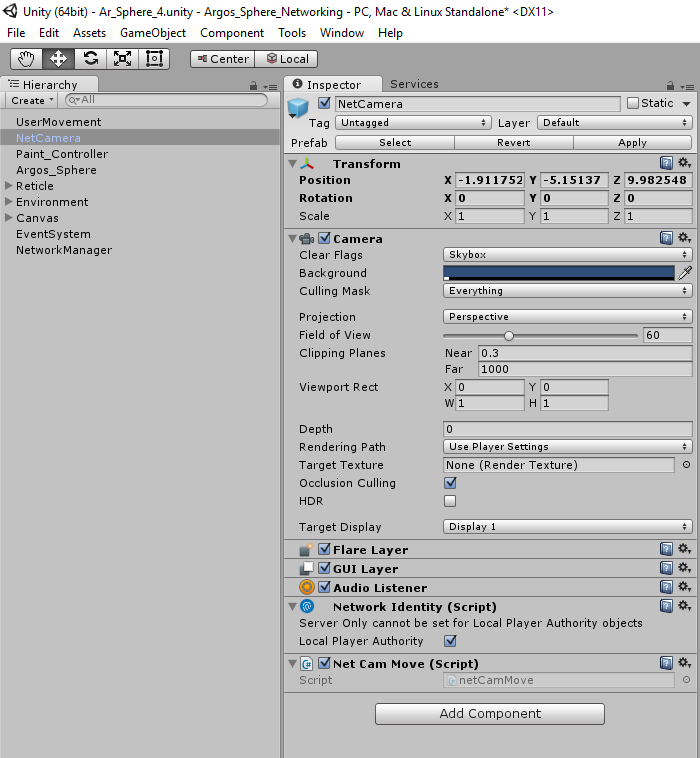 Once the player prefab is created, it must be registered with the network system. The first piece of game functionality is to move the player object. This will first be done without any networking, so it will only work in a single-player mode. 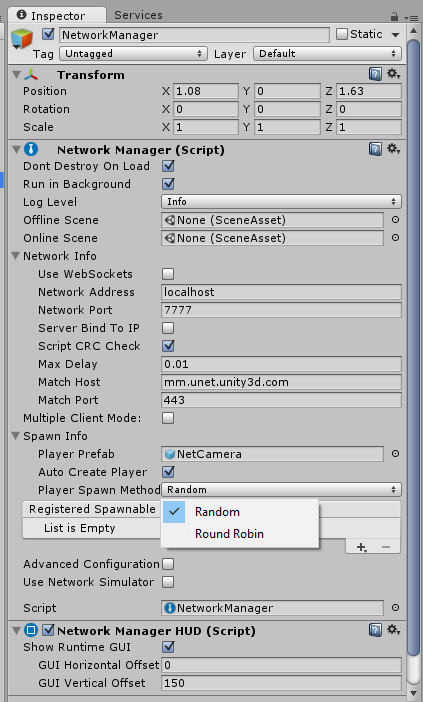 Find the NetCamera prefab in the Asset view. 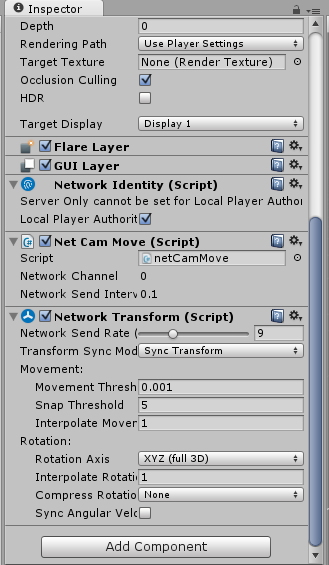 Enter the name “NetCamMove” for the new script name. A new script will be created. This hooks up the cube to be controlled by the arrow keys or a controller pad. The cmaera only moves on the client right now – it is not networked. Press “Host” to start the game as the host of the game. This will cause a netCamera object to be created, and the HUD will change to show the server is active. This game is running as a “host” – which is a server and a client in the same process. Pressing the arrow keys should make the netCamera object move around. 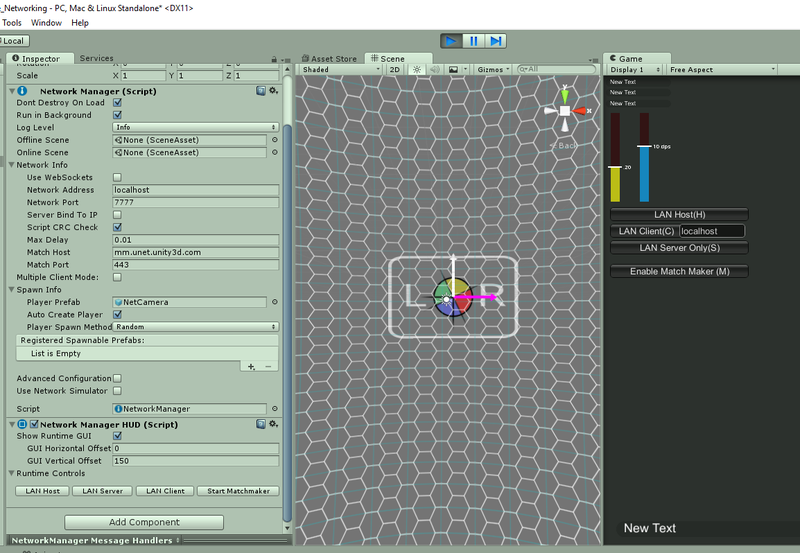 Exit play mode by pressing the stop button in the editor. Use the menu File -> Build Settings to open the Build Settings dialog. A stand-alone player will launch, and show a resolution choice dialogue. The stand-alone player will start and show the NetworkManager HUD. Switch back to the editor and close the Build Settings dialog. Both cube currently move! -No- This because the movement script is not network-aware. Click the “Add Component” button and add the Networking -> NetworkTransform component. This component makes the object synchronize it’s position across the network. The player objects should now move independently of each other, and are controlled by the local player on their client. The cubes in the game are currently all white, so the user cannot tell which one is their cube. To identify the player, we will make the cube of the local player red. The OnStartLocalPlayer function is a good place to do initialization that is only for the local player, such as configuring cameras and input.